Two triangles is twin peaks for sure. Maybe the fact that there are two columns (red circle over one, crescent and "ace/mother/?" over the other) means two separate worlds. It'll be like a conjuction in time and space with those events lining up in both worlds to open a door. Throwing my money down on that one. On 10/1 is the red circle. On 10/2 the red circle is eclipsed by the ace card symbol. I needed to put the picture up for reference. 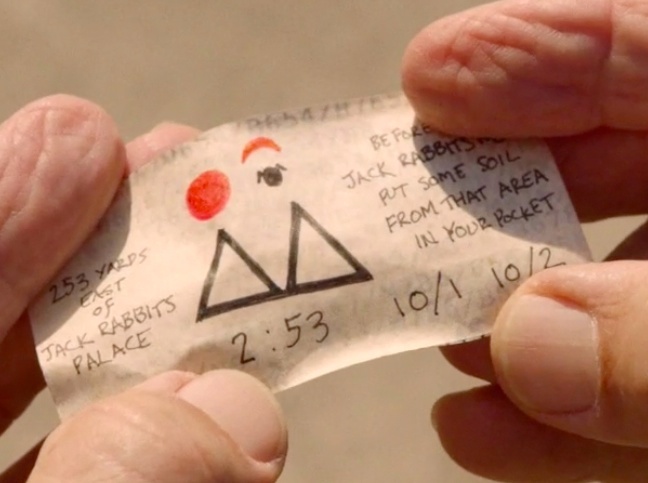 Maybe 10/1, 10/2 signifies a time jump. When major Briggs disappeared in the original series he was gone for two or three days. The soil could be an anchor to bring them back to the right place. In October 2014 (which is the year current events in the show are taking place in) there was a total lunar eclipse. And guess what? It was also a blood moon (red circle and red crescent?). But it was October 8. I SAW THAT BLOOD MOON. Seriously though, if this goes down like this in the next couple episodes I'm going to scream. And that scream is going to sound like "BloooOOOD MOOOOOOOON"
You mean Jupiter aligned with Saturn, one eclipsing the other? Let's see if I can find anything online, that arrangement at those 2 dates. Mm, I think if Briggs meant Black & White Lodge, he shoulda blackened 1 triangle.... ? And since next week's blurb is "Laura is the one," maybe when they find the entrance to the White Lodge / alternate dimension that's not a Lodge, they'll meet that place's Laura (not our Earth's Laura, or the Laura at the Black Lodge).